Mark Bowden is probably best known for his book Black Hawk Down. In Worm, he chronicles the rise of the Conficker worm and the cooperation of a collection of civilian super geeks that formed to combat this relatively new and unique Internet threat. When Bowden published Black Hawk Down, I was blown away. Bowden puts you right in the streets of Mogadishu, Somalia, with the soldiers, rangers, and bad guys who made up that fight. And then, when the movie came out and was equally as intense, I felt like I had some smidgen of understanding regarding what the U.S. armed forces had to deal with during this specific fight but, more generally, what they have to endure every day when they are deployed to the Middle East. When I heard that Bowden was taking a stab at the story behind the Conficker worm, I was excited. He is a high-caliber author attempting to describe the geeky details of the cyber security community at a key point in our history. I was hoping that he would make what we do in the security community sound as interesting and astonishing as he made the soldiers sound in Black Hawk Down. I think that he accomplishes this task but not in the way that you might think. He succeeds in giving a bird’s-eye view of our community’s collective thinking process. He captures our almost universal and delightful -- if a bit naive – belief that we should all help each other out and contrasts that to the relative size of our egos and how self-destructive that can be to a group effort. As you may recall, Conficker is a worm that started targeting victims running the Windows operating system in 2008. For the nontechies in the crowd, a worm is a piece of malicious code designed to compromise a computer and then replicate itself automatically through the network to as many computers as it can. Every compromised host belongs to the worm’s collective called, in generic terms, a botnet or a robot network. It is a robot network because the owner of it can direct every machine within the collective to do his or her bidding: deliver spam, decipher encryption, dispatch denial of service attacks, etc. John Brunner, the author of The Shockwave Rider, first wrote about the idea of a worm in his prescient 1975 novel 10 years before the Internet really existed. Around the same time, Robert Thomas built the first proof-of-concept worm called Creeper, which was designed to be an experimental mobile program in which the program itself would look around the network to find the best computer to use for its task. It was not until 1988 when the Morris worm brought the Internet to its knees that we all began to understand what a malicious application of a worm might accomplish. Today, botnets are reusable. Authors send new instructions to their botnets when they want to repurpose them through some sort of command-and-control mechanism. The difference between a virus and a worm is that a virus does not try to spread on its own. Good worms spread very fast. Famous worms in our short Internet history include the Morris worm, Code Red, and Slammer. In the Slammer case, the worm infected 90 percent of the vulnerable computers connected to the Internet within ten minutes of the first infection. Let me restate that again so that you understand the magnitude of that incredible statistic: of the 75,000 machines connected to the Internet that were vulnerable to the attack, the worm compromised 90 percent of them in the first ten minutes after it compromised victim zero. The mind boggles. Bowden spools the story out on two threads. The first thread is the description of the punch-counterpunch between the cabal and its adversaries. The Conficker authors released the first version of the worm, called Conficker A, in late 2008. In order for the newly infected host to receive instructions from the botnet’s command-and-control center in the future, the Conficker malcode generated 250 strings of random-letter domain names each day computed through an algorithm of the author’s design. Each day, the infected host would try to communicate with each domain name in the list. If the authors wanted the Conficker botnet to accomplish a task, they would install the command-and-control center at one of the 250 domains for the scheduled day and deliver the instructions when the infected host tried to communicate with it. When the cabal members reversed engineered the malcode, they learned about the daily domain-name-generation routine. Their first counterpunch was to compute the 250 randomly generated domain names every day before the attackers could use them, purchase those domains, and route all traffic to a sinkhole computer residing on Amazon’s Simple Storage Space (S3). To use a chess analogy, the cabal put the Conficker authors in check. The authors responded by releasing a serious upgrade to the worm, called Conficker B, that used better encryption and more-efficient infection techniques, which resulted in 1.5 million compromises a day. It took the cabal longer to figure out what the worm was doing, but the group’s strategy of sinkholing the domain names was still intact. Check again. Finally, the Conficker authors released a third upgrade, Conficker C, which they designed with the intent to make it practically impossible for the cabal to orchestrate any kind of defense against it. Instead of generating 250 domain names a day, the new algorithm generated 50,000 domain names a day across multiple top-level domains, requiring the cabal to coordinate across international boundaries with governments and non-governmental organizations that do not traditionally play nicely together. This change significantly upped the work level required to put the worm in check again. The goal was to be ready for a 1 April 2009 deadline where all of the hosts within the Conficker C botnet would reach back to their command-and-control centers to receive new instructions. Nobody knew what those instructions might be, but because the Conficker authors had not used the botnet for anything up to this point, the cabal was worried that 1 April might be the day the Conficker authors unleashed the botnet against the world. This first thread of punch-counterpunch is fascinating and shows how two groups of übergeeks—the cabal and the Conficker authors —who understand the Internet and its systems in a way that mere mortals could not comprehend did battle over a two-year stretch in a classic white-hat-versus-black-hat confrontation. Rarely does the public get to see this interchange in the public arena. Other books that cover similar battles are Clifford Stoll’s The Cuckoo’s Egg and David E. Sanger’s Confront and Conceal. The second thread of the story is about the people working in the cabal. This is where Bowden hits the ball out of the park. He compares the group members to the X-Men, Marvel Comics’ super hero team with mutant abilities. Bowden describes how most of the cabal members had realized at one time or another that compromising computer systems was pretty easy. That ability was their mutant superpower. Most normal people -- like my wife, for example who is the smartest person on the planet on every other subject -- have a hard time simply understanding the computer’s on-off switch. These übergeeks did not. And when they were doing their normal day jobs, they assumed the role of the mild-mannered Clark Kent: not intimidating and practically invisible to the rest of the world. If you are a security geek of any sort, you most likely had your comic book time sometime in your life. For some of us, it was very short. For others, we have never let it go. (Yes, I have been to two—count them, two—different Comic-Con conventions and had a great time at both.) With his superhero analogy, Bowden captures the essence of the cabal but, most importantly, the essence of us all in the security community, and I thank him for it. He chronicles the day when technicians deployed the first two Internet routers, called Interface message processors (IMPs), in 1967 between Menlo Park and UCLA. He describes that eureka moment in 1974 when Vint Cerf (Stanford) and Bob Kahn (DARPA) presented their paper detailing the revolutionary way to transmit data across IMPs called Transmission Control Protocol (TCP). He explains the 1998 hand-off from SRI to the ICANN of the responsibility of coupling IP addresses with domain names. He provides a short history of Microsoft’s rise to power, an abbreviated history of the evolution of hacktivism, and a timeline of DDoS attacks, including the sobering attack against the 13 DNS root servers in 2002. Bowden has a knack for taking complex Internet technology and explaining it in a way that even a nontechie can understand. He uses a wonderful analogy comparing a botnet to the Starship Enterprise, explains the Internet by comparing it to human brain function, and describes buffer overflows by demonstrating how a chef reads recipes and cooks food in a kitchen. He does a decent job explaining the function of communications ports, why malcode is packed (compression and stealth), the difference between dynamic and static malcode analysis, why bad guys obfuscate their code, and how public key encryption and the Domain Name System (DNS) work. Bowden covers the period from the inception of the cabal in late 2009 until June 2010. He describes the cabal’s efforts to thwart the Conficker operators from making the botnet operational so that it didn’t become the largest cyber weapon in the Internet’s short history to date. Bowden’s critics deflate the importance of this book because the Conficker authors never used the system to any significance. Actually, two weeks after the 1 April 2009 update, the Conficker authors rented the botnet to a well-known spammer named Waladec, and in June 2011, US and Ukraine law enforcement officials arrested 16 Kiev hackers who used Conficker to steal $73 million from international banking accounts. However, nobody used the botnet to take down the Internet like the Morris worm did. After the cabal finally succeeded in getting the security community worried about the potential threat, the 1 April deadline came and went with a whimper. The press compared it to the other great nonevent of our Internet history: Y2K. The cabal did not succeed in eradicating the worm from the Internet either. The group stopped it from receiving instructions—check—but they were unable to kill it—no checkmate. At last count, Conficker continues to infect some twenty-four million computers connected to the Internet. But all of that criticism is short-sighted. I worked for iDefense (a VeriSign Inc. business unit) the first time that I wrote about Worm. Actually, iDefense and Verisign both had a small part to play in Bowden’s tale. Jason Greenwood, the current iDefense general manager and an old friend of mine, has graciously allowed me to reuse some of the original content from that essay for this updated blog post. iDefense is still one of the best commercial cyber security intelligence outfits out there. If you have cyber intelligence needs, you should consider calling those guys. 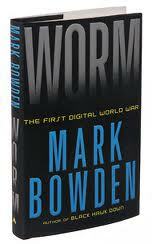 Worm: The First Digital World War is a Cybersecurity Canon Candidate. Please visit the official page sponsored by Palo Alto Networks to read all the books from the Canon project.